Structural engineers from all corners of the world face similar problems, regardless of whether they work in civil-, mechanical-, or another engineering field. On the one hand, they have to deal with contractors who come with audacious plans to construct the highest, the longest, the most spectacular, the most technologically advanced buildings ever made. On the other, they have to tackle the everyday tasks of engineering practice with efficiency and ease. 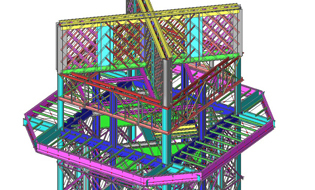 SCIA Engineer, a graphical software system for design, calculations and code-checking of structures, fits into both categories. It has been primarily designed to serve civil engineers; nevertheless, it finds its application in other engineering fields too. SCIA Engineer is an ideal tool for calculations in any dimensionality from a simple beam (1D), to a single plate (2D), to a whole building (3D) to a detailed analysis of distribution of internal forces over time in prestressed structures (4D). Globalisation has inevitably also affected the engineering industries. Established engineering companies merge into transnational corporations, but even smaller design offices serve clients from neighbouring or distant countries. This brings new demands on both the engineers and the tools they use. SCIA Engineer is localised into 10 languages and is distributed with a set of integrated libraries. 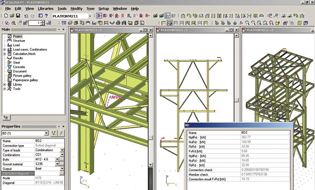 These libraries store code-related materials for various national standards, steel cross-sections from different manufacturers, reinforcement typical for individual national codes, etc. 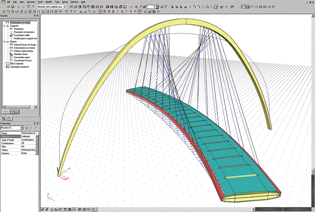 SCIA Engineer offers built-in design and checking functions for numerous national and international codes of practice. Successful, economical and efficient realisation of a construction project requires effective cooperation of all parties involved: architects, structural engineers, design professionals, facility managers. The data each profession needs are partly unique, but a certain amount of data is shared by all parties. And the key prerequisite is that these data are shared smoothly and without losses. SCIA Engineer represents a compact BIM solution whose “True Analysis” feature makes it possible to handle both types of data. The structural model stores the architectural data (shared with other applications) necessary for drawings. 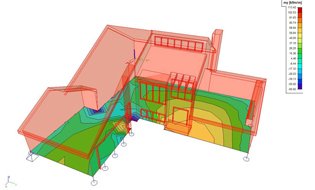 The analytical model contains information required for calculations and design (unique SCIA Engineer data). Moreover, the sophisticated update function in SCIA Engineer moves the ordinary import/export capabilities to a new dimension with its capability to merge together analytical models from two separate projects or combine the analytical model processed in SCIA Engineer with a structural model modified in an external application. What has also changed over time is the type of results that are expected by engineers. 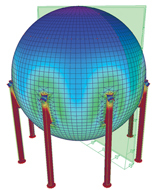 In the past, deformation and internal forces in nodes and elements of the finite element mesh were enough. Today, the user expects all imaginable types of results including code checking and optimisation. SCIA Engineer comes with a sophisticated “Autodesign” feature. A particular member of the structure can be optimised inside the code-checking function. Alternatively, the structure as a whole can be optimised for strength-and-stability or fire resistance of members or for capacity of bolted connections. And finally, a model can be parameterised and optimised for the selected parameter.